IMG_3031, originally uploaded by Lookin4TallGuys. CHS covered the ceremonial groundbreaking. Frequent CHS Flickr pool contributor Lookin4TallGuys was there for the real thing Saturday night as the first Broadway pavement was torn up to make way for construction of the First Hill streetcar. 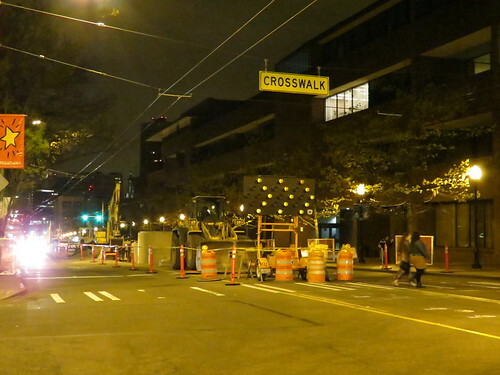 This weekend, crews were busy ripping up the trees and median in the center of Broadway by Seattle Central. For more on the line and what to expect on Broadway during construction, check out our latest report on the project. This entry was posted in Uncategorized by CHS Staff. Bookmark the permalink. With residences across the street from the Market I don’t know of a better time to do this work (I’d usually say middle of the night). I was there during set-up at 9:30 (helping a friend unload) and the construction guys helped with the load-in as much as they could. Vehicles pulled up to the curb and were unloaded quickly. I saw one bus that waited a minute as a vehicle was unloading at the curb but overall it went pretty well considering major median demolition was happening a few feet away. I was surprised that it worked as well as it did. It was nice that people did what they could to keep things moving and there weren’t any flaggers or police yelling at people to move along. Does anyone know if the trees were able to be moved? It would be a shame if they were simply cut down. I was curious about this. ScottA – What you saw on Sunday is not how it will be for most of the summer. Starting in June the curb lane will be torn up all along the west side of Broadway, so all market vendors will have to park off site (where, no one has told us yet) and carry/hand truck our goods into the market site. It was great to have the construction guys help yesterday (hope it didn’t violate their Union rules), but once all ~50 vendors need that kind of help, I doubt the construction company will allow that to continue. 1). Guaranteed space for us to unload and leave our trucks during the market, ideally less than a block away from the market site. Help loading our goods into the market site would be nice, but at least we need a place to park and unload. 2). Temporary cessation of noisy activity (jackhammering, loading chunks of concrete into metal dump trucks) during the 4 hours that the market is open. 3). Pedestrian access to be maintained, and additional signage provided around the hill so folks know that the market is still going on. We were originally told the construction wouldn’t begin in front of SCCC until July . Now we don’t really know what to expect from week to week. Farmers will be there trying to make a living… hope our shoppers don’t forsake us! They are being preserved and will be replanted, per Seattle Streetcar. Thanks! Glad to know that. I was afraid they were too big for them to be carted off somewhere, but really happy to hear that is not the case. Your 3 requests seem very reasonable. If they really do need to work on the streetcar during the market times I wondered why the market wasn’t moved to the tennis/basketball courts in Cal Anderson (add a few gates to the fences) or maybe close 10th from Pike to Pine. It was crazy noisy with pavement demolition happening so close and it didn’t seem very safe with heavy equipment working a few feet from traffic/pedestrians and concrete rubble potentially spraying passers by. The problem with the tennis courts, or many other likely-seeming large open spaces, is that they also don’t allow for trucks to pull up and unload on site. One of the problems we will experience this season is the inability to unload our trucks in close proximity to our stall spaces. Most vendors will have to unload at least a full block away from our spaces, and carry or hand-truck our goods into the market. Unfortunately, they’ve scheduled the demolition of the western lanes of Broadway from June through September, the time of year when farmers have the biggest (and heaviest) crops to bring to market. I’ve also thought about whether there’s any other place to temporarily move the market, but all the big empty spaces have similar load-off challenges. We’ve recently been told that SDOT will be providing some extra signs around the neighborhood to advertise the market, but the noise during market hours is apparently non-negotiable. I also thought the movement of large equipment so close to a large crowd of people seemed questionable from a safety standpoint… Next weekend they’ll be working down on Pine. We’ll see how it goes!